Want to know something? I actually am not disappointed that we didn’t go away this week. The sunny and warm weather we’ve had all week has been Ah-Maz-ING! We’ve reached 80’s the last couple of days! The gorgeous weather this week has gotten me extra excited about our upper patio deck makeover. 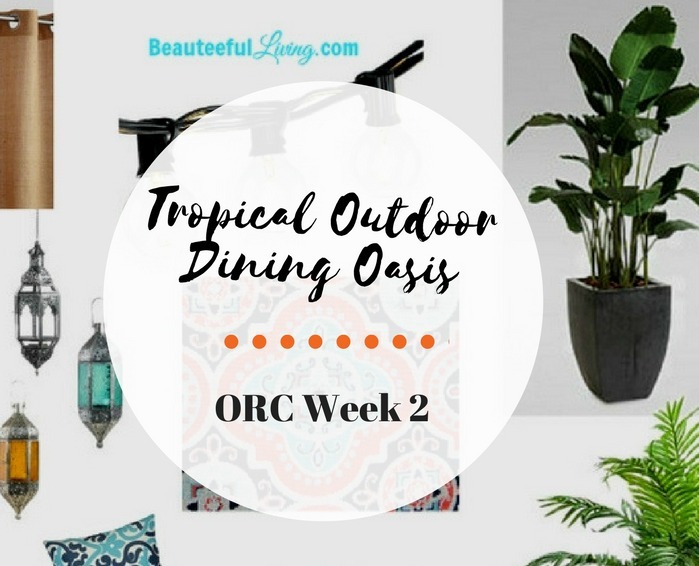 I’m officially dubbing this my “Tropical Outdoor Dining Oasis” project. The title isn’t very innovative (rather cliche if you ask me..haha) but it’s the best way to describe the look and feel that I’m after! 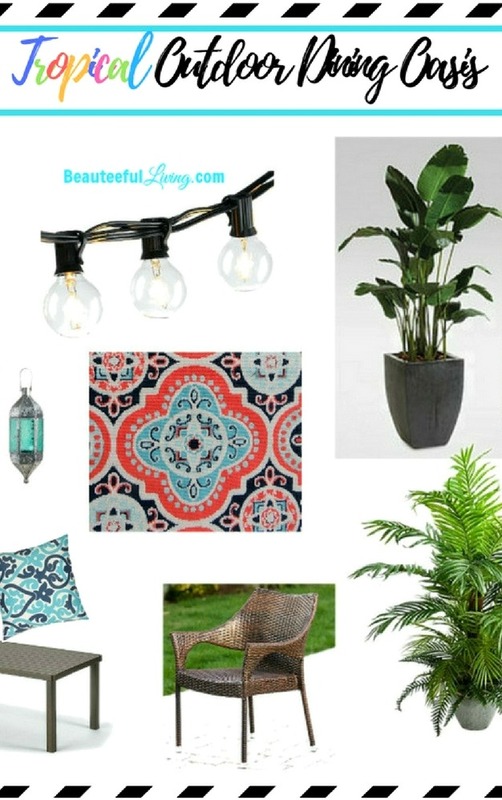 Here again are the inspiration photos behind my “Tropical and Moroccan” design motifs. Bottom Left: Urso Designs Inc.
Out of all of the items shown in my design board, I only have 2 in my house right now. Currently, I have the rectangular coffee table and that colorful outdoor rug you see in the center. 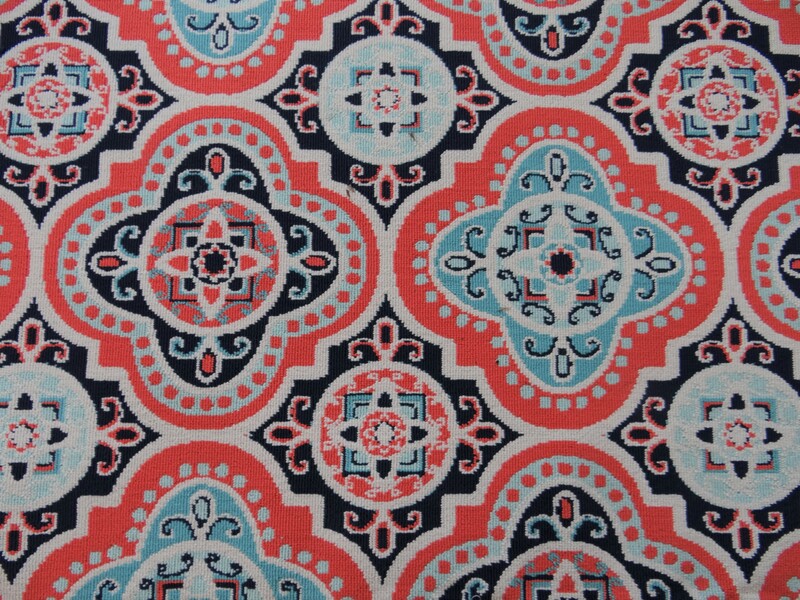 I just purchased this 6 feet by 9 feet rug last week! I’ll share all the details about the rug and the other items in an upcoming post. Stay tuned! 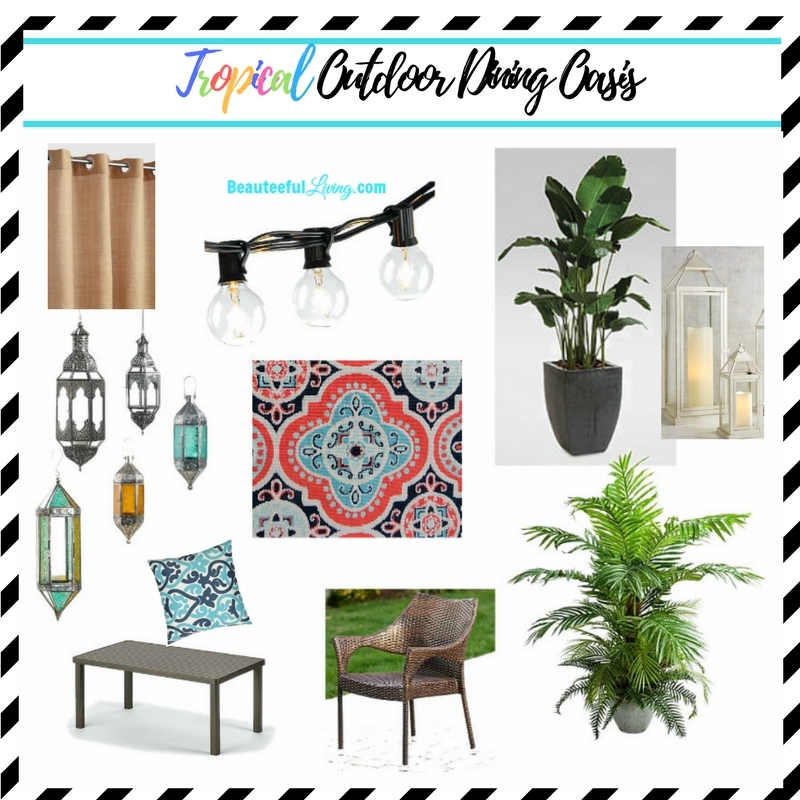 Like my “Tropical Outdoor Dining Oasis” design board? Please PIN/Save/Share. Thanks to World Market and A & M Garden Center for being sponsors of my guest participation in this spring’s One Room Challenge! Be sure to check out the 20 Designers featured HERE and guest participants linking up HERE on the Calling It Home website. Love the area rug you chose it will really bring a Moroccan feel to the space. 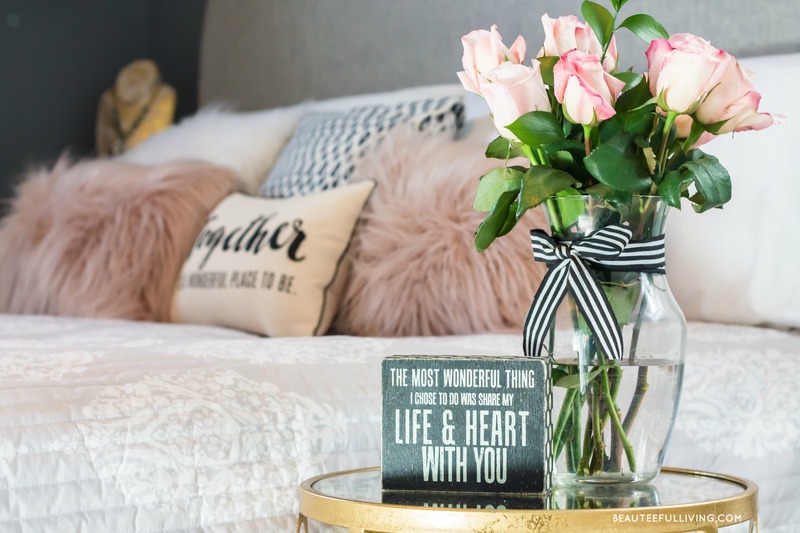 I also adore all of the “twinkle” light that you have chosen not only will they add to the overall home decor but they also create a welcoming and warm space. I love all of the plants and the lights. It’s going to be such an inviting space. Can’t wait to see how it turns out! This is going to look beautiful, Tee! We’ve been having lovely weather here too! Wow, 80’s?! That’s summer weather! Your design plan makes me want to go on a tropical vacation. Beautiful! Enjoy spring break with the kids, and Happy Easter! Thanks so much, Carol! We’re really enjoying our little staycation..lol. Have a wonderful Easter too! I am loving this makeover – I am pretty good with INDOOR spaces but my design sense OUTSIDE is HORRIBLE!!!! Really pathetic!!! – I am lost and overwhelmed by the vastness and usually end up just letting the natural landscaping speak…which is just sad…so I am hoping to find inspiration here!!!! Thanks so much for following along this makeover! I’m very excited to see this place transformed. Good luck with sprucing up your backyard this summer! I love the rug! Such fun and fresh colors to work with! Love that rug!! And outdoor string lights always make a space feel finished and fun. What a fun plan! Bright, cheerful, and the perfect chill spot. Love the design you’ve come up! I would love to make our deck more fun and entertaining! Love the rug and the direction you’re going with it! It’s going to look great! That rug is gorgeous Tee! This is going to look so darn good once it’s all in place. Who says you can’t style it and enjoy it a bit sooner than week 6?! A Tropical oasis is my favorite! Can’t wait to see it all come together. I love your inspiration. I love your idea board for your outdoor space! Everything looks great! Oooh Loving this! Love the colors and the lights. This definitely will be a tropical oasis! I’ve been excited to see your mood board after those pretty inspiration pictures. It look great, and I love those lanterns! I’m loving all the colors in your design board! Can’t wait to see the transformation! Love the colors in the rug! the rug is SO fun! Plus, I love those string lights! Thanks, Sarah! I want to string everything I have outside with lights. Ha! I really like the rug and the plants really liven up an outdoor space. that rug is so fun! love the colors!